Leonard J. Larson was born circa 1915 at South Dakota. He was the son of Adolph L. Larson and Josephine B. Englund. Leonard J. Larson married Katherine Marie Anderson on 12 June 1941. Leonard J. Larson died in 1981. [S250] U.S. Federal Census 1930 U.S. Federal Census, by Ancestry.com, Year: 1930; Census Place: Spink, Union, South Dakota; Roll: 2232; Page: 2A; Enumeration District: 0015; Image: 219.0; FHL microfilm: 2341966. 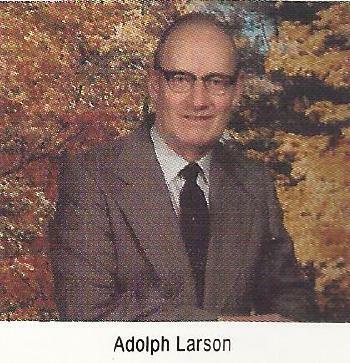 Adolph J. Larson was born on 31 July 1917 at South Dakota. Adolph J. Larson died on 25 July 2011 at age 93 Adolph J. Larson was born in rural Spink, SD to parents Adolph and Josephine (Englund) Larson on July 31, 1917 and died July 25, 2011, just 6 days shy of his 94th birthday. Adolph received his elementary education at Spink School, and graduated from Elk Point High School after staying out one year to help on the farm following the death of his father. He was baptized and confirmed at Brule Creek Lutheran Church, rural Elk Point, SD where he remained a member until 1994 when he became a member of Bethany Lutheran Church, Viborg, SD. He served in the U.S. Army from May, 1942 until January, 1946. During his service he was involved in training operations state-side and the Philippines. Upon discharge from the army, Adolph joined his brother as owner & operator of the Spink Store. They continued this partnership until Leonard's death in 1981. Adolph then moved to Beresford. What a delightful surprise it was when Adolph, at the age of 77, ended his bachelorhood and married Dorothy Larsen on September 24, 1994. Their shared love of music brought them together and the love they had for one another was an inspiration to many as they told "their story." Adolph is survived by his wife, Dorothy, her children and their families, sister-in-law, Katherine Larson, and nieces and nephews who cherish his memory: Helen Hoyer Kahl, Mark Hoyer, Bernie Hoyer, Gail Larson Swee, Steve Larson, Janet Davis Krueger and Alan Davis. He is also survived by numerous great-nephews and nieces, many of which enjoyed his willingness to play games with them, teach them to play cards and "puzzle" together. Adolph was preceded in death by his parents, sisters, Margaret Hoyer, Alvira Miller and Helen Davis and his brother and business partner, Leonard. A memorial service will be held 2:00PM, Friday, July 29, 2011 at Wass Funeral Home in Beresford. A burial of Adolph's urn will be at Brule Creek Cemetery, rural Spink, SD. Adolph's family appreciates your presence here today and invites you to join them for refreshments at the Beresford Senior Events Center following memorial services. Helen T. Larson married (?) Davis. Helen T. Larson was born circa 1920 at South Dakota. She was the daughter of Adolph L. Larson and Josephine B. Englund. Helen T. Larson died before 2011. Helen T. Larson was confirmed in 1934. Leland A. Larson was born circa 1915 at South Dakota. He was the son of Johan Martin Larson and Augusta Anna Carlson. Martin C. Larson was born circa 1916 at South Dakota. Reuben Larson was born circa 1918 at South Dakota. 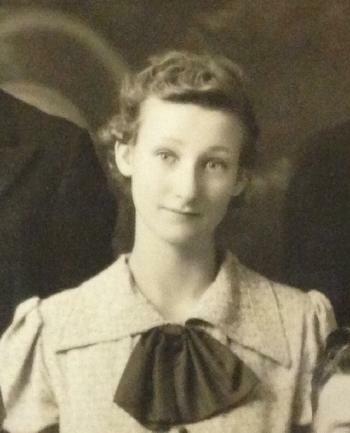 Lucille Larson was born circa 1919 at South Dakota. She was the daughter of Johan Martin Larson and Augusta Anna Carlson. Married Name Her married name was Fiedler. Aletha (?) married Herbert Jacob Fiedler, son of Frederick William Fiedler and Caroline Rose Mader. Aletha (?) was born on 1 December 1903 at Kansas. She died on 25 September 1990 at age 86. She was buried after 25 September 1990 at Lee Mission Cemetery, Salem, Marion, Oregon. Samuel Theodore Kerns married Alice W. Crum. Samuel Theodore Kerns was born on 29 September 1847 at Pennsylvania. He died on 12 June 1936 at age 88. Married Name Her married name was Kerns. Alice W. Crum married Samuel Theodore Kerns. Alice W. Crum was born in 1865 at Ohio. Married Name circa 1883 As of circa 1883,her married name was Hinman. Married Name before 1893 As of before 1893,her married name was Westerman. Mary M. (?) was born circa 1862 at Minnesota. She married (?) Hinman circa 1883. Mary M. (?) married Daniel Westerman before 1893. Mary M. (?) died after 1940. 30 June 1898 U.S., Indian Census, Santee, Knox, Nebraska Mary M. (?) appeared on the census of 30 June 1898 in the household of Daniel Westerman at U.S., Indian Census, Santee, Knox, Nebraska; Tribe: Santee Sioux (Sioux). [S250] U.S. Federal Census 1930 U.S. Federal Census, by Ancestry.com, Year: 1930; Census Place: Yankton, Yankton, South Dakota; Roll: 2232; Page: 1B; Enumeration District: 0022; Image: 942.0; FHL microfilm: 2341966. [S373] U.S. Federal Census 1940 U.S. Federal Census, by Ancestry.com, Year: 1940; Census Place: Yankton, Yankton, South Dakota; Roll: T627_3870; Page: 2A; Enumeration District: 68-19. Daniel Westerman was born circa 1868. He married Mary M. (?) before 1893. 30 June 1898 U.S., Indian Census, Santee, Knox, Nebraska Daniel Westerman appeared on the census of 30 June 1898 at U.S., Indian Census, Santee, Knox, Nebraska, Tribe: Santee Sioux (Sioux). Name Variation Ferne Elaine Westerman was also known as Fern. Ferne Elaine Westerman was born on 14 January 1934 at South Dakota. She was the daughter of William R. Westerman and Marie Justina Fiedler. Ferne Elaine Westerman died on 14 July 2006 at age 72. Ferne Elaine Westerman lived with William R. Westerman in 1935 at rural, South Dakota. [S373] U.S. Federal Census 1940 U.S. Federal Census, by Ancestry.com, Year: 1940; Census Place: Norfolk, Madison, Nebraska; Roll: T627_2257; Page: 9B; Enumeration District: 60-17. Name Variation Milo Erwin Trumble was also known as M. E.
Milo Erwin Trumble was born in February 1855 at New York also reported as Pennsylvania. He married Viola E. (?) circa 1884. Milo Erwin Trumble died on 23 June 1947 at age 92. [S245] U.S. Federal Census 1900 U.S. Federal Census, by Ancestry.com, Year: 1900; Census Place: Okobojo, Sully, South Dakota; Roll: 1554; Page: 5B; Enumeration District: 0318; FHL microfilm: 1241554. [S243] U.S. Federal Census 1920 U.S. Federal Census, by Ancestry.com, Year: 1920; Census Place: Iowa, Sully, South Dakota; Roll: T625_1725; Page: 1A; Enumeration District: 285; Image: 1084. [S373] U.S. Federal Census 1940 U.S. Federal Census, by Ancestry.com, Year: 1940; Census Place: Pierre, Hughes, South Dakota; Roll: T627_3857; Page: 2B; Enumeration District: 33-12. Married Name circa 1884 As of circa 1884,her married name was Trumble. Viola E. (?) was born in December 1861 at Virginia. She married Milo Erwin Trumble circa 1884. Viola E. (?) died in 1936. Viola E. (?) had 6 with 5 living in 1900 children. Leslie M. Johnson was born on 1 November 1923 at South Dakota. He was the son of George Warren Johnson and Elizabeth M. Fiedler. Leslie M. Johnson died on 23 March 1999 at California at age 75. [S250] U.S. Federal Census 1930 U.S. Federal Census, by Ancestry.com, Year: 1930; Census Place: Springfield, Bon Homme, South Dakota; Roll: 2217; Page: 3B; Enumeration District: 0016; Image: 400.0; FHL microfilm: 2341951. [S373] U.S. Federal Census 1940 U.S. Federal Census, by Ancestry.com, Year: 1940; Census Place: Springfield, Bon Homme, South Dakota; Roll: T627_3848; Page: 1B; Enumeration District: 5-17. Marvin E. Johnson was born on 27 July 1925 at South Dakota. Marvin E. Johnson died on 16 August 1974 at Los Angeles, California, at age 49. George Warren Johnson Jr. was born on 27 December 1928 at South Dakota. George Warren Johnson Jr. died on 6 April 1990 at Los Angeles, California, at age 61. Richard Lee Johnson was born on 28 February 1930 at South Dakota. Richard Lee Johnson died on 16 March 1989 at San Joaquin, California, at age 59. Ward G. Johnson was born on 11 May 1932 at South Dakota. Ward G. Johnson died on 17 January 1992 at Los Angeles, California, at age 59. Name Variation Harry W. Johnson was also known as H. W.
Harry W. Johnson was born in July 1873 at Iowa. He married Laura A. Metcalf circa 1896. Harry W. Johnson died before 1920. 1910 Springfield, Bon Homme, South Dakota He was listed as the head of a family on the 1910 Census at Springfield, Bon Homme, South Dakota. [S245] U.S. Federal Census 1900 U.S. Federal Census, by Ancestry.com, Year: 1900; Census Place: Letcher, Sanborn, South Dakota; Roll: 1553; Page: 7A; Enumeration District: 0297; FHL microfilm: 1241553. Harry Johnson was born circa 1913 at South Dakota. He was the son of Harry W. Johnson and Laura A. Metcalf. As of 1940, Harry Johnson was never married. [S243] U.S. Federal Census 1920 U.S. Federal Census, by Ancestry.com, Year: 1920; Census Place: Springfield, Bon Homme, South Dakota; Roll: T625_1714; Page: 1A; Enumeration District: 18; Image: 478. [S250] U.S. Federal Census 1930 U.S. Federal Census, by Ancestry.com, Year: 1930; Census Place: Springfield, Bon Homme, South Dakota; Roll: 2217; Page: 3A; Enumeration District: 0016; Image: 399.0; FHL microfilm: 2341951. Married Name circa 1896 As of circa 1896,her married name was Johnson. Laura A. Metcalf was born in December 1872 at England also reported as 1873. She married Harry W. Johnson circa 1896. Laura A. Metcalf died in 1936. 1910 Springfield, Bon Homme, South Dakota Laura A. Metcalf was listed as wife in Harry W. Johnson's household on the 1910 Census at Springfield, Bon Homme, South Dakota. Laura A. Metcalf immigrated in 1882. She had 2 with 2 living in 1900 children. She had 10 with 7 living in 1910 children. Alfred Walter Johnson was born circa 1904 at South Dakota. Alfred Walter Johnson married Lucile Dempster on 4 September 1928 at Yankton, South Dakota. 1910 Springfield, Bon Homme, South Dakota Alfred Walter Johnson was listed as a son in Harry W. Johnson's household on the 1910 Census at Springfield, Bon Homme, South Dakota. Peter Johnson was born circa 1908 at South Dakota. 1910 Springfield, Bon Homme, South Dakota Peter Johnson was listed as a son in Harry W. Johnson's household on the 1910 Census at Springfield, Bon Homme, South Dakota. Woodrow W. Johnson was born in 1913 at South Dakota. Woodrow W. Johnson married Marie Lange on 27 August 1936 at Yankton, South Dakota. Woodrow W. Johnson died in 1986. Name Variation Laura A. Johnson was also known as Annie. Laura A. Johnson was born circa 1916 at South Dakota. She was the daughter of Harry W. Johnson and Laura A. Metcalf. Frank S. Johnson was born in April 1897 at South Dakota also reported as 1898. Frank S. Johnson died in 1940. 1910 Springfield, Bon Homme, South Dakota Frank S. Johnson was listed as a son in Harry W. Johnson's household on the 1910 Census at Springfield, Bon Homme, South Dakota. Fred B. Johnson was born on 6 June 1901 at Bon Homme, South Dakota. 1910 Springfield, Bon Homme, South Dakota Fred B. Johnson was listed as a son in Harry W. Johnson's household on the 1910 Census at Springfield, Bon Homme, South Dakota. Mary Johnson was born circa 1902 at South Dakota. 1910 Springfield, Bon Homme, South Dakota Mary Johnson was listed as a daughter in Harry W. Johnson's household on the 1910 Census at Springfield, Bon Homme, South Dakota.